FORJAS AREITIO S.A.U. has a Quality and Environment Management System certificate according to ISO 9001 and ISO 14001 standards. This certification represents an approach to management and success based on the excellent quality of our products and services, and also our commitment and respect for the environment. SATISFY CUSTOMER DEMAND AT ALL TIMES, meaning our product supply meets the highest quality standards as well as our clients’ requirements. REACH SUSTAINABLE DEVELOPMENT that will keep our production going preventing pollution and other issues in compliance with the current environmental regulation. EFFICIENCY in our use of raw materials, energy and water. MARKET-SHARE GROWTH thanks to a high-quality, cost-effective product as a result of efficient management processes. WORK with a FLAWLESS mindset reducing the chances of potential risks to both staff and the environment. GET ALL PARTIES, that is workers, suppliers, subcontracted firms and management INVOLVED in order to achieve our goals. ONGOING IMPROVEMENT IN OUR PRODUCT AND MANUFACTURING PROCESSES by means of watching for opportunities and implementing new actions. PROTECT THE ENVIRONMENT AND REDUCE OUR CARBON FOOTPRINT with an appropriate administration and management of our relationship with the environment. 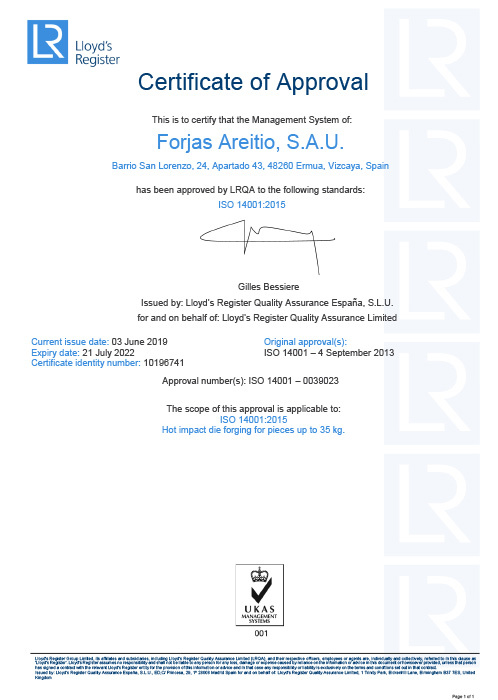 Finally, it is a firm commitment of FORJAS AREITIO to incorporate these principles into our organisational structure and constantly improve all our processes with the implementation and maintenance of a Quality Management System based on the UNE EN ISO 9001 and UNE EN 14001 regulations.